Kapake contains two active ingredients, paracetamol and codeine, which belong to a group of medicines called analgesics or painkillers. Paracetamol and codeine block and suppress pain signals that are transmitted to the brain via the nervous system. These two medicines combined are a powerful painkiller that can be used to treat many pain symptoms. Kapake is prescribed to treat pain from various conditions, such as headache, post-operative pain, pain from injuries, the flu and common colds, rheumatic pain, lumbago, menstrual pain, toothache, or pain caused by other factors. Swallow the tablet or capsule whole with some liquid. Kapake may be taken on an empty stomach, during meals or after meals. If you are taking more than one dose of Kapake a day, remember to leave at least four hours between doses. If you have missed a dose, you may take the missed dose unless it is almost time for your next scheduled dose (less than a four hour-interval). Never take an extra tablet of Kapake to make up for the forgotten dose. See package leaflet for more information. Kapake is available in tablet form in two strengths: 15/500 (15 mg codeine and 500 mg paracetamol per tablet) and 30/500 (30 mg codeine and 500 mg paracetamol per tablet). 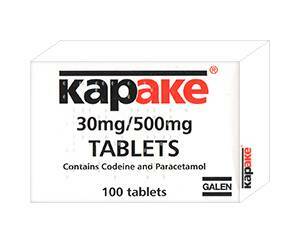 Kapake is also available in capsule form (30 mg codeine and 500 mg paracetamol per capsule). Strength and daily dose must be determined by a doctor. Children aged 12 to 18 should only take this medicine in consultation with a doctor. Kapake in the above strengths is not suitable for children under the age of 12. Kapake should only be used in consultation with a doctor if you are pregnant or breastfeeding. Alcohol intensifies the effect of Kapake, causing increased drowsiness and dizziness. It is advisable to reduce or stop drinking alcohol while taking this medicine. Kapake may cause you to feel drowsy, dizzy or sleepy. Only participate in traffic if you do not experience these side effects.